To connect with our pool of talented employees – many with years of experience at McKinsey, Bain or BCG – please complete the application form below. We screen employers to provide our job-seeking members with unique premium job opportunities that are diverse by geography, industry and company type. After you submit your application, we will inform you if you’re “on ice” or “on fire.” If your company is accepted as an “on fire” preferred employer, you will be offered a wide range of opportunities to connect with our member base. The minimum base salary per full-time posting is $75,000, and the minimum contract position rate is $75/hour. 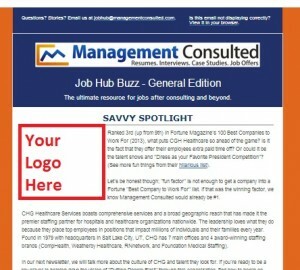 As an “on fire” employer, you will also be featured in the Savvy Spotlight of our Job Hub Newsletter sent periodically to our experience professional, job seekers. We look forward to working with you!